Free Press Unlimited made significant changes to its organisational structure in 2015. This is hardly surprising, since we were in the process of developing a new Theory of Change that is intended to increase the impact of our projects and programmes. And this also calls for a different type of organisation: one that is more flexible, and that concentrates around our five key themes. These changes are reflected in our organisational chart for 2016: the adapted structure is really starting to gain shape. Free Press Unlimited is growing and professionalising at a rapid pace. This required us to make sizeable investments in 2016: in a professionalised HRM policy, a new MEAL system and the elaboration of our thematic Theories of Change. But it also extended to our financial department since over time, donor reporting requirements have become more and more complex. We created a number of new positions in 2016, including a fundraising specialist for private donors and a policy officer who bears responsibility for our international lobbying and influencing activities. Moreover, we added new members to a number of thematic teams in response to developments within our projects. 2016 was also an exceptionally busy year because we were expected to both wrap up our activities within the second co-financing scheme MFS II (having taken part in no fewer than five alliances) and simultaneously launch our new Strategic Partnership with the Dutch Ministry of Foreign Affairs. Our team members had to handle a hefty workload. But thanks to their dedication and expertise, we have managed to pull off this daunting task. We are duly proud of the result. How do we structure our organisation so that we can both deliver solid results and achieve our objectives? Free Press Unlimited has decided on a network structure that allows our project teams and support teams to efficiently exchange knowledge and information. We work with six project teams, each of which is headed by a project leader who coordinates his or her team’s substantive activities. Four of the teams are associated with a specific region: MENA (Middle East & North Africa)/Eurasia, Sudan, Eastern Europe/Russia and Fragile Africa. In addition, we have specialised teams for the focus areas Youth & Media and Gender, Innovation & Safety. In 2016, two of our programmes in the MENA-Eurasia region – the Syria programme and the Russian-Language News Exchange – expanded so quickly that we decided to merge them into a new team. Our teams range in size from 3.9 fte in Youth & Media to 13.6 fte in the large Sudan team, which also comprises the team members of Radio Dabanga. This work is in part possible thanks to our colleagues in Free Press Unlimited’s seven supporting teams: Communication, Knowledge and Quality Assurance, Donor Relations, Human Resources Management, Office Management, Security and Finance. They ensure that our everyday operations run smoothly and that we are ready to take on the future. Free Press Unlimited is a foundation. We have chosen a governance model based on a division of roles between a supervisory and an executive body. This offers the Board of Directors the necessary scope and flexibility to take quick and decisive action where required. In addition, its accountability to the Supervisory Board ensures that it manages the organisation responsibly and effectively. The Board of Directors has two members: Leon Willems and Ruth Kronenburg. respectively Director of Policy & Programmes and Director of Operations. The Directors are responsible for the organisation’s day-to-day operations and account to the Supervisory Board. Their tasks and responsibilities have been set down in Free Press Unlimited’s Articles of Association and in the foundation’s Management Regulations. The Directors are advised by the management team (made up of the team leaders), which meets once every two weeks. How much do the Directors of Free Press Unlimited actually earn? For their remuneration, we refer to the Dutch charity sector organisation VFI’s Recommended Remuneration Scheme for Directors of Charitable Organisations (Adviesregeling Beloning Directeuren van Goede Doelen) and Code Wijffels. For their virtually unlimited availability and commitment, the Directors are paid a gross salary of € 87.570 per year (Leon Willems) and € 78.649per year (Ruth Kronenburg). The Directors held a number of unpaid ancillary positions in 2016, which related directly to their regular work for Free Press Unlimited. Leon Willems served as the Chair of the Global Forum for Media Development until September 2016. He will continue to support this organisation as a special adviser. Ruth Kronenburg is a Member of the Advisory Council of Pro Bono Connect, a project initiated by the Netherlands Committee of Jurists for Human Rights (NJCM). Neither of the Directors is reimbursed for these ancillary activities. Free Press Unlimited’s Supervisory Board is the official employer of the Board of Directors. It monitors the organisation’s results and is free to intervene whenever it deems this necessary. The Supervisory Board bears responsibility for Free Press Unlimited’s overall strategy and reaches its decisions on the basis of annual budgets and reports. What did the Supervisory Board do in 2016? In three countries, Free Press Unlimited has set up local production offices that handle very large productions on location. Over the past few years, we have worked to strengthen these offices so that they can continue without further financial support. This ‘hiving off’ is proceeding according to plan. The office in Somaliland has since become entirely self-sufficient, and the office in South Sudan, Free Voice, has also made considerable progress in this area. This process will be rounded off in early 2017. In 2015, we expanded our Knowledge and Quality team to a total of five members. This step started bearing fruit in 2016 with the introduction of the new MEAL framework and the Theory of Change. Among other things, the team bore responsibility for organising the baseline workshops in the countries where we will be implementing ‘No News is Bad News’. The team members didn’t rush into this. In February, they organised a trial run of the workshop in Indonesia and Tanzania, after which they made a number of adjustments and set up an internal training programme. Only then did they make a serious start with the workshops in 13 partner countries. Free Press Unlimited is a knowledge and project organisation, and it is important to us to consolidate and increase this expertise and quality. Over the past year, Free Press Unlimited worked together with Maastricht University to develop four scenarios for Nigeria’s media landscape. Which stages of an authoritarian regime are imaginable in this country, and which role could the media play at each stage? Which position can Free Press Unlimited adopt in this context? Scenario planning also plays a role in the initiative that we took with eight other organisations to increase the scope for civil society. This scope is under considerable pressure in a large number of countries. We are working together with our partners on an analysis of likely future scenarios in five different countries – and what are options would be in each case. Free Press will concentrate within this initiative on developments in Egypt. Free Press Unlimited and Hivos are taking the lead in this project, in which the sharing of knowledge and information plays a crucial role. How are we doing as an organisation? To assess our performance, we have adopted a number of widely-recognised quality standards. ISO 9001 is one such ‘quality management system’. Every year, LRQA establishes whether our organisation satisfies the relevant requirements. ISO has also introduced the special Partos standard for the international development sector. Partos is also the name of the Dutch association of NGOs active in this field. Our existing ISO certification is valid until the end of February 2018. Free Press Unlimited has been an Erkend Goed Doel (Recognised Charity) since 2016. This new certification mark has replaced the former CBF certification. In July 2016, a leading group of 350 organisations, including Free Press Unlimited, were the first recipients of this revised certificate issued by collaborating certification bodies like CBF and Goede Doelen Nederland. Erkend Goed Doel (Recognised Charity). In 2015, we prepared to move toward project reporting in accordance with the standards of the International Aid Transparency Initiative (IATI). In late 2016, all 17 projects executed by Free Press unlimited within the context of the Strategic Partnership could be found on the IATI website. However, we have agreed not to publish any information that could endanger individuals or organisations in any way. We have set down which details we will or will not make public in a special Exclusion Policy. We have also drawn up our own Code of Conduct, which all members of our staff comply with. In addition, as a member of Partos and the charity sector organisation Goede Doelen Nederland, Free Press Unlimited also adheres to the codes of conduct drawn up by these organisations. Free Press Unlimited stands for access to information. We are advocates of openness, transparency and accountability. At the same time, our commitment to transparent communication is occasionally at odds with the poor security situation in some of our partners’ countries. In practice, it is impossible for many of the media organisations in the countries that we are active in to be entirely transparent. Their employees would immediately be murdered or imprisoned. This means that in some cases, Free Press Unlimited cannot be transparent either: for example, we cannot publish the names of any people we work with. And some of our donors do not want to be mentioned by name in our publications either. In short, Free Press Unlimited opts for transparency as long as there is no risk of endangering people. We can see another dilemma arising in our gender equality policy. Free Press Unlimited attaches such a strong importance to gender equality that the financial support to our partners is even partially dependent on this matter. A prospective partner organisation that does not want to think about its own role in this context is unlikely to obtain our support. But in some of the countries that Free Press Unlimited is active in, many partners have a completely different perspective on gender-related problems. How should we approach this issue? Which scope have we identified for improvement? In 2017, Free Press Unlimited will be making a closer study of these questions in partnership with Erasmus University Rotterdam. In 2016, Free Press Unlimited included risk analyses in each of its country year plans. In addition, we made a start on developing a risk analysis for our organisation in the fields of strategy, implementation, people and finance. This means we have already taken a significant first step towards the formulation of a complete risk analysis in the course of 2017. 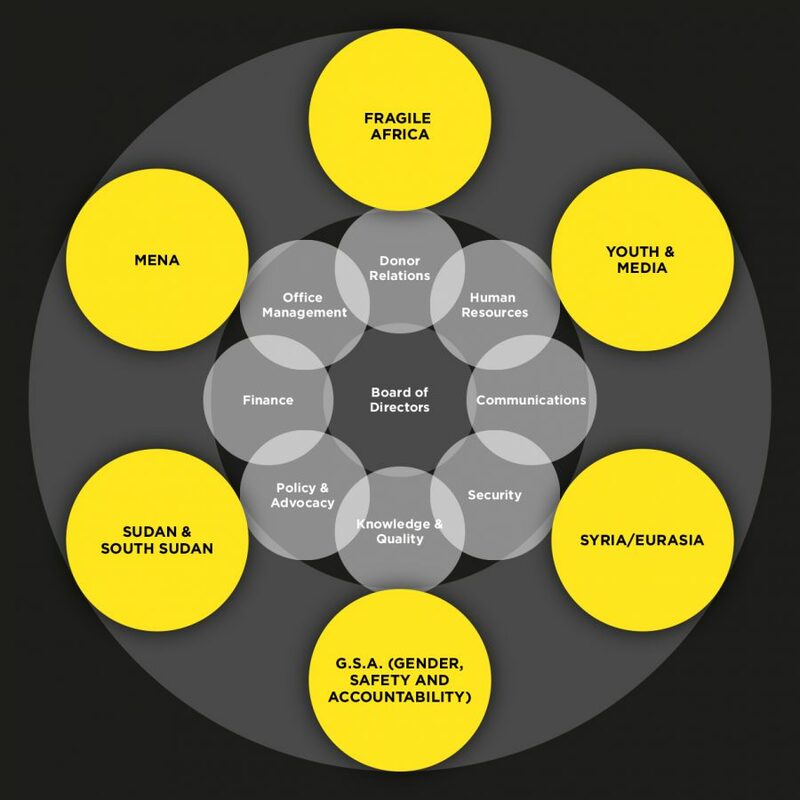 The following chart sets out the key risk factors for Free Press Unlimited and its activities. One problem that has given us quite a few headaches is finding a solid information system that we can use to manage our projects. This is something of an untapped market: there’s no such thing as the perfect system. Nevertheless, we intend to source the best system available – we are convinced that in the longer term, this will benefit us both in operational and financial terms. We performed extensive research, engaged the services of an external consultant and asked fellow organisations to give us an idea of how their systems worked. In late 2016, we started a pilot programme with the system that best suits our requirements. An additional advantage of this option is that it is open source software, meaning that everyone who uses this system can benefit from our investments. In early 2017, the test run will hopefully have led to a positive evaluation, after which we can start implementing the new system throughout our organisation. This project management information system will help us to monitor, evaluate, account for and learn from our projects (we refer you to ‘How do we measure the impact of our work? (MEAL)’). We are growing out of our offices. Or rather: we are having trouble sharing the available space with other organisations. Right now, we share our premises on Weesperstraat in Amsterdam with our partner Greenhost. After fruitless attempts to find new and affordable joint base, we have decided in consultation with Greenhost that they will be moving to a new office on their own. This means that our calendar for 2017 also includes a re-organisation of our offices. At Free Press Unlimited, we strive to minimise our CO2 emissions as far as possible. What kind of measures have we taken? We encourage staff to travel by means of public transport and work from home. We use green electricity from renewable sources like solar power and wind. We book climate-neutral flights. We offset our emissions via the Climate Neutral Group. Over the past few years, we have considerably reduced the volume of paper used by our organisation – mainly by cutting down on printing. And when we source products or services, we select the most sustainable and environmentally-friendly option wherever possible. Our employees form the mainstay of our organisation. Without their knowledge, experience, dedication and passion, we would not be able to achieve our goals. Unfortunately, we are unable to pay them the salary they deserve for their hard work. Remuneration levels at Free Press Unlimited are significantly below international standards. That is why we do our best to create a pleasant and supportive work environment and offer them attractive fringe benefits like training opportunities. Our employees form the mainstay of our organisation. Free Press Unlimited aims to be an attractive employer. Our human resources management needs to be professionalised further. At the end of 2016, Free Press Unlimited employed 68 people, and throughout the year our workforce consisted of 60.9 fte on average – 10 fte more than in 2015. A total of 27 employees left the organisation in the year under review (compared to 15 in 2015). Seven of them left to pursue new growth opportunities elsewhere or for personal reasons. In the case of five staff members, their contract was not renewed because the project they were working on had been rounded off. We parted ways with two employees in mutual consultation. Three employees left because they were here temporarily for replacement during (maternity) leave. One employee passed away. In 2016, we welcomed no fewer than 27 new colleagues (2015: 12). Of this number, six employees (representing 6.2 fte) worked abroad – within our Syria programme and the new Russian-Language News Exchange, among other projects. In 2016, we held an employee satisfaction survey among our staff. This survey went into subjects like the current workload, our organisation, collaboration with colleagues and the staff’s direction by the MT. We took a long, hard look at ourselves. Sometimes this wasn’t easy, but this step was welcomed by our people nonetheless. And it had direct consequences for our organisation: some staff members wondered what the MT meetings were actually for. And why these meetings didn’t include the Communication and Knowledge and Quality Assurance coordinators. They had a point. In addition, the Board of Directors spends a relatively large amount of time on operational issues. While this is a common situation in fast-growing organisations, this threatens to overwhelm the Directors themselves. As of 2017, the two-weekly meeting of the MT will be replaced by a strategic management meeting, which is held once every quarter. This meeting will be attended by the Board of Directors and the team leaders, as well as the aforementioned coordinators. In addition, the team leaders and the coordinators will meet once a month for consultation. If they fail to reach a decision on some matter, they can discuss it with the Directors during a regular bilateral meeting. The Board of Directors was also very satisfied with the process and results of the survey. A number of operational tasks that were previously handled by the Board of Directors have now been taken on by other members of the organisation – leaving more time for the Directors to focus on management and delegation. Another conclusion is that while we may learn a lot at the individual level, we are not learning enough as an organisation. We will be immediately setting to work on this issue in 2017. In January, we will come together for one week to reflect on our activities and draw collective lessons from our insights. In 2016, Free Press Unlimited presented its new gender equality policy. And of course, as an organisation, we need to set an example in this area. As far as the male/female ratio is concerned, we’re doing quite well: Free Press Unlimited employs 34 women and 32 men. The ratio is less balanced at the management level. The MT is made up of 3 women and 6 men; the Board of Directors consists of one man and one woman. Free Press Unlimited strives to fill more managerial vacancies with female candidates. The average age of our employees is 42, with a relatively even distribution of age groups: under 35: 25 employees; 35-50: 23 employees; 50-65: 16 employees. In 2016, our organisation was strengthened by 12 interns and 11 volunteers. We have a clear policy for our intern programme that includes clear guidelines for recruitment and task descriptions. We see internships as a win-win deal: our internsgain relevant work experience, while we often get unexpected, occasionally critical questions that keep us on our toes as a learning organisation. Our (often young) volunteers also enjoy deploying their capacities for our work. In 2016, they contributed to our events, wrote copy for our website, translated for us, helped during lunches and supported us in processing the results of our surveys. In 2016, our absence due to illness rate fell quite spectacularly to 1.7%. In 2015 this rate still stood at 4.4% – which can mainly be explained by two long-term illnesses – but in 2014, this percentage was also significantly higher: 2.15%. If you compare our 2016 rate of 1.72% to the national average of 4.1% absence due to illness, it appears as if our efforts to create a healthier work environment are starting to pay off. An independent, external trust committee can serve as a point of contact for employees who wish to lodge a substantiated complaint about a matter that they are unable to resolve with their direct manager. Free Press Unlimited offers other channels of recourse for complaints pertaining to the organisation or employment law. In early 2016, the trust committee received a number of informal complaints. To take these informal complaints into consideration, they needed to be formalised – and the committee urged the complainants to take action to this effect. Unfortunately to no avail. That is why after consultation with the Board of Directors , the trust committee decided to also discuss informal complaints and determine whether they merited contacting the Supervisory Board. In addition, the Board of Directors took the initiative to hold an employee satisfaction survey and brought in a staff consultation expert. These measures seem to have paid off: by the end of March, it had been six weeks since the last informal complaint had come in. The trust committee, which is made up of a male and a female member, is jointly nominated by the Board of Directors and the staff representative body (personeelsvertegenwoordiging). The members of the trust committee are not remunerated for this work. In principle, they serve for a two-year term, which can be extended for another two years. In October 2016, the members stepped down at the end of their second term, which was celebrated in style. Free Press Unlimited is currently in the process of forming a new trust committee. Every member of our staff is free to take advantage of our Continuous Professional Development Plan (CPDP). As implied by the name, this plan organises employees’ on-going acquisition of new skills and knowledge for their personal development and that of their team. This plan also provides scope for trainings that contribute to the overall functioning of our organisation. In 2016, for example, we started to work with a wiki environment rather than a shared drive on our server. After we organised an organisation-wide training, all country plans for 2017 were jointly developed within this wiki. In addition, over the past year, we offered trainings in a variety of areas, including data management, encryption, physical safety and crisis management. We have a number of new trainings on our calendar for 2017, with a stronger focus on substantive aspects of our programmes. One of the conclusions that we could draw from the employee satisfaction survey is that there is a strong need for personal support – possibly even more than for training. That is why in 2017, both the members of our Executive Team and the team leaders will be trained by coaches, enabling them to provide more effective support to their team members. In light of Free Press Unlimited’s rapid growth, we will be replacing our former staff representative body (personeelsvertegenwoordiging) with a full-fledged works council. In 2016, we jointly examined which shape this body should take, which tasks and authorities are assigned to a works council and how to ensure a smooth transition. This will be put into practice over the course of 2017. Our staff representative body convened on some 20 occasions in 2016, of which seven meetings were also attended by the Board of Directors and four meetings by the organisation’s entire staff. Important topics of discussion during these meetings included the new job descriptions, a new salary system, the employee satisfaction survey, the election of a new staff representative body and, of course, the transition toward a works council. Many of the countries Free Press Unlimited works are faced with government repression or armed conflict. Intimidation, violence, kidnappings and arrests are the order of the day. Journalists are particularly at risk. That is why we have adopted an active safety policy that each member of our staff has to comply with. Our employees are required to complete a compulsory safety training and stay up to date on developments in our safety policy and security recommendations. A number of staff members attended this training or a refresher course in 2016, and we also organised a training that focused on crisis management. However, we shouldn’t limit ourselves to the physical safety of our staff and partners. Another – increasingly important – area of attention is digital security. Free Press Unlimited’s database contains a large volume of sensitive data, from personal information about our partners and individual journalists to the financial details of our projects. If they were to be leaked, in extreme cases, this breach could result in people being imprisoned, or worse. That is why we made work of this as early as 2014, appointing a security coordinator, developing an information security policy and training our staff in a variety of safety measures, including the encryption of their emails. In 2016, we also invited a white hat hacker to test the security of our systems. The hacker’s findings were shared with the entire staff, and we have asked the hacker to regularly revisit our organisation to test the current security arrangements. This keeps us on our toes, and keeps our data safe.